Political Zionism started in the late 1800s as an international movement to establish a Jewish state somewhere in the world. By 1897 the movement was led by Austrian journalist Theodor Herzl, who convened the First Zionist World Congress in Basel, Switzerland the same year. U.S. Zionism began in the 1880s. The Board of Delegates of American Israelites was organized in 1861. The group was strong enough during the American Civil War to block an effort by the Union to declare America a Christian nation. But after Knox, simply every American official has opposed Zionist efforts to involve the United States on the same grounds: the efforts are against the interests of the United States. The Zionists were and are aware of this, so they always resorted to secrecy to conceal their real aims. high Zionist affairs. He recruited young lawyers, particularly from Harvard, to work for the Zionist cause. He was a leader of a secret society called the Parushim to work for Zionism with all the outward appearance of simply a fraternal order. Each member took a practically blood oath to secretly work for Zionism. Weir very astutely and brilliantly covers World War One and the Balfour Declaration (Britain promising to support a “national home” for Jews in Palestine). The Declaration was critical for Zionist success with the reason behind it, Zionism’s promise to work for the U.S. to enter the war on Britain’s side. Author Alison Weir writes that whether the Zionist role in getting America into the war was major, as the Zionists claim, and the British believed, is unclear. In one of her quoted references Chaim Weizmann, who later became the first president of Israel, complains in his autobiography about the British/Zionist myth that he invented TNT, the reward for which was the Balfour Declaration. He said he did not invent the explosive. The origin of the TNT myth was an obvious attempt to cover up Britain’s real reason for issuing the declaration, which clearly was to get America into the war on Britain’s side, without which she would have lost the war. Ms. Weir’s coverage of the 1919 Peace Conference in Paris is excellent. The Conference was rife with Zionists arguing for the Jewish state. The most prominent American opposing them was Dr. Howard Bliss, president of the Syrian Protestant College, later the American University of Beirut. President Wilson did send the King-Crane Commission to study what the Middle Easterners wanted. The two men found that the Arabs were utterly against the “national home” idea. It was clear that the Jewish representatives wanted a nearly complete dispossession of the Palestinians and that armed force would be required to carry out Zionist aims. Throughout Judgment Alison Weir clearly documents the total lack of ethics and morality, as generally understood, on the part of the Zionists. For example, they fabricated stories of gross anti-Semitism in Poland to gain sympathy. When the American ambassador to Poland reported that they were false, Brandeis and Frankfurter claimed that the ambassador had undercut their mission. Frankfurter threatened that he would try to block his Senate confirmation. It is important to emphasize that essentially all official American personnel opposed the Zionists. Foreign Service Officer Evan Wilson, U.S. consul general in Jerusalem, opposed them on national interests grounds. Loy Henderson, director of the Office of Near Eastern and African Affairs, wrote that supporting partition of Palestine “would have a strongly adverse effect on American interests throughout the Near and Middle East.” When Henderson persisted in putting his views forward, the Zionists attacked him viciously, calling him an “anti-Semite,” demanding his resignation and threatening his family. Henderson was transferred by President Harry Truman as ambassador to Nepal/India. The transfer of Henderson reflects the reality of what happens to Foreign Service officers who criticize Israel, even today. Others who spoke warning words about Zionism and its adverse effect on American national interests were George F. Kennan, head of the State Department’s Policy Planning staff. He wrote that the 1947 partition plan for Palestine had done enormous damage to the U.S. Under Secretary of State (later Secretary) Dean Acheson said that to transform Palestine into a Jewish state would imperil not only American but all Western interests in the Near East. 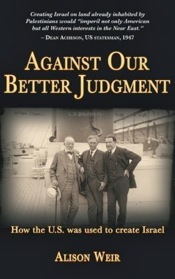 Judgment is prodigiously documented, with nearly 200 books and papers listed. Weir quotes two sources, one of them an Iraqi Jew, as writing that the Zionists terrorized Iraqi Jews into going to Israel by planting bombs in Baghdad synagogues, all to increase the population of Israel. Jews even killed Jews to force immigration to Israel. In 1948 there was a battle between Secretary of State (General) George Marshall and Clark Clifford, political adviser to President Harry Truman, over Truman’s support for Zionism/Israel. Marshall argued for national interests, while Clifford argued for electoral politics. Marshall quit speaking to Clifford over their differences. In April 1948, just before the State of Israel was established, Jewish terrorists attacked the Palestinian village of Deir Yassin, massacring 175 men, women and children. The facts spread quickly in Palestine and 750,000 refugees fled from their homes. The Zionists had anticipated the flight, leaving room for Jews in the evacuated homes and farms. The ruthlessness of the Zionists is illustrated by the fate of Dorothy Thompson, “one of the most famous journalists of the 20th century,” according to the Britannica encyclopedia. Her columns were in newspapers all over the country, her radio program was heard by millions of people. She had been married to one of the most famous novelists (Babbitt), Sinclair Lewis. Now that Israel has been around for more than 60 years and its virtues are sung in the American media, it is easy to forget, or not even to have heard, that the country is extremely adverse to American national interests and its policies enormously destructive and dangerous to America’s well-being. Thus Alison Weir must be highly commended for throwing such a brilliantly hard light on the relationship between the United States and Israel. I hope this marvelous book gets all the attention it deserves. All in vain: Jews are leaving the abscess of mass theft and genocide styling itself ‘Israel’, while the goyim continue to proliferate there, ethnic cleansing or no ethnic cleansing. In a generation, the Zionist enterprise will be nothing more than a footnote in the history books.